We begin with a conversation – what do you need, want, like, dislike. We then schedule a custom fitting appointment to correctly measure both horse and rider. Our goal is to achieve perfect balance by combining the fit with a properly constructed seat. Each saddle is specifically tailored to each individual. Back at our workshop we trace the pattern for each flap of the saddle onto paper, then cut out each shape. 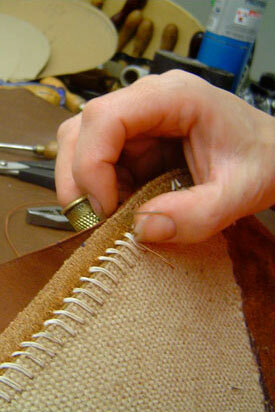 The patterns are then transferred to the leather of your choice. Each flap is hand cut from our selection of buffalo and calf hides that are imported from England and France. Once the patterns have been made and the leather cut it is time to start on the tree. The high quality trees, made from laminated beech-wood and steel, are imported from England. The first thirty minutes work on the tree are probably the most important in the entire process. This is when the balance of the seat is formed. The measurements taken at your individual fitting are verified and each custom part of your saddle is prepared and properly shaped. The result is a perfectly balanced saddle that has been custom made for you and your horse.